Mom #1 is a stay-at-homer, a homeschooler, who has several children of various ages and genders, and spends her days on housework, schoolwork, and shuttling kids from one activity to another. She’s organized, she’s intelligent, and she is creative. She likes to make sure that her kids are challenged, and she spends the majority of her time finding teachable lessons in every activity. Mom # 2 is a stay-at-homer with young children. She spends her time cooking, cleaning, doing housework, picking up toys that keep getting vomited from the playroom, changing diapers, feeding babies, and chasing said children around until she’s too tired to function. Her prayer is that the baby will eventually be so exhausted that he’ll fall asleep and nap for at least one hour so that she can shower. Mom #3 is a working mom. She works hard at her job all day and often has to bring that work home with her. Her kids spend their days in daycare or school, and mom often defers to take-out to feed the kids because the after-work hours are spent running to and from dance, soccer, baseball, tutoring, and every other activity under the sun. She wishes for some down time and looks forward to vacation. Which mom are you? Most of us are a combination of these, but no matter what kind of mom you are, we all share one thing in common– the vast majority of our waking hours are spent doing things for other people. And that is as it should be. “Me time” is a phrase that really shouldn’t exist in a mom’s verbal repertoire, because the moment one becomes a mother, “me time” ceases to exist. We all know that motherhood, when enjoyed properly, is a 24/7/365 job. However, many mothers seem to lose their personal identity when their children come along. For example, if someone asked you to describe yourself, your answer would most likely begin with, “I’m a wife and mother…” and go on from there. But what if someone asked your children to describe you and what you like to do? Besides the tasks you complete out of responsibility, would they know how to describe who you are based on what you do and what you love outside of your family? Think about it for a minute– remove your children from the equation and really think about it– Who are you? What are you passionate about? What drives you, besides the love you no doubt have for your children? What are your hobbies? What sets you apart and adds to your identity? Why is having a passion important? Answering the above questions is a task that every woman should undertake. It is vitally important to the relationships you have in your life that you have a passion or hobby other than your kids. It’s also important to your own mental health. Having an identity outside of your children is part of being the amazing, individual woman that God created you to be. Show your children just how special you are and how special they can become by following their own passions. When you are passionate about something, not only can it be a wonderful example to your kids, but when your children are grown and gone, you’ll have something about yourself that remains “you,” maybe even something you can share with your spouse when you are empty nesters. Let’s say you have discovered your passion. How do you effectively pursue that “me time” in order to maintain a healthy balance between yourself and your family and not go overboard in either direction? Here are some tips to pursuing your passion purposefully. Get involved. Don’t be “sort of” passionate. Find something you love and go for it! If you can’t figure out what you are passionate about, start with your talents or hobbies. The world of the blogosphere is incredible- begin reading blogs that discuss your talents or hobbies and you might just discover a passion there. Consider starting a blog yourself. You might find that blogging becomes your passion. If you have been wanting to lose weight, consider that your passion may be in getting healthy or working out. This is a great passion to extend to your family. Perhaps you are passionate about politics. Consider volunteering on a local campaign. Passionate about music? Consider joining your local church choir. Love teaching? How about volunteering to teach Sunday school? Perhaps consider starting a tutoring service. Love photography? Take some classes at a local university and start snapping those shots! Love to read? Consider starting a book review blog for your friends and family or simply joining a book club. Love to cook? Take a cooking class or a cake decorating class. A hobby like this could actually become a lucrative business. Passionate about helping others but don’t know how? Contact your church for a list of suggestions of areas where you could volunteer, or consider contacting a nursing home to see if you could volunteer to be a “buddy” and spend time sitting and talking with some of their residents each week. Not only will you be pursuing your passions, you’ll be blessing someone else! There are literally thousands of ideas, but you have to decide where your passions lie. Be realistic. We sometimes cannot help what we are passionate about, but if you find that your passions lie with sword fighting, for example, stick to proper fencing lessons and stay away from dangerous sword play. We encourage our kids to think about safety first, and so should we. Also, wait until your kids are grown to pursue a passion such as archaeology. If you leave for a dig site in Egypt and miss the actual childhood of your kids, you’ve kind of missed the point. Stick to books about archaeology until you really do have the time to pursue such a passion, or one like it. Get on a schedule. Putting your family on a schedule, one that includes your family activities as well as meal times, bed times, wake-up times (important for summer), TV times, nap times, school time, etc., will help you figure out when you can carve out a tiny bit of time for yourself in order to pursue your passion. Let’s be realistic, though. 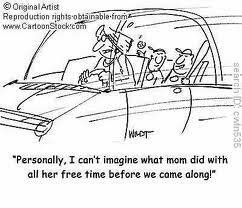 The majority of moms will be unable to make time for themselves daily. Try for once a week, and then see if you are able to add on. A regular nap time & bed time are not only healthy for your kids, they will provide an excellent source of time that you might be able to take advantage of! Find support. If you need help, ask for it. Ask your hubby to pitch in around the house occasionally so that you might have a bit of time for your passion or hobby. If need be, get a babysitter. If you have friends who love to do the same thing that you do, organize a childcare swap so that you can each take turns doing what it is that you love. Include your kids. Whatever it is that you love, introduce it to your kids! They may not love it as much as you do, but exposing your children to your passions will encourage self-confidence (Look at how Mom really goes for it when she plays tennis! ), indulge their creativity (Mom makes great pottery. I wonder if I can do that? Maybe I can even paint! ), encourage their imagination (I love talking to Mom about her writing. I wonder if I can tell stories, too. ), and enhance their compassion (Mom really likes helping people. I think I want to volunteer at the shelter, too. ), among other things. Of course, the point is to carve out time for yourself so that this is a solo activity, but exposing your kids is a necessity if you are going to take time away from them to pursue it. They’ll be able to see the passion in you, and it will rub off on them as they begin to discover their own passions in life. Girl time is not “me time.” Many of us enjoy the privilege of getting together occasionally with our girlfriends. An evening out with them does not count as pursuing your passions. Sure, we love our friends, but we’re talking about making time for something; some talent, some hobby or passion, that we can pursue on our own. If your passion happens to overlap with girl time (like playing on a softball team) then, great! Make memories. Life is about living, and many moms feel “stuck” in the rut of the day-in day-out monotony. Use your passions to help you and your family make memories. Most importantly: Don’t let a hobby become an obsession. There’s a huge difference between pursuing a passion and neglecting family time. Be careful that you stick to your schedule and remember that no matter how passionate you are about what you are doing, you should be even more passionate about spending time with your family. Remember that passion does not equal obsession. With all of the other things moms have to balance, you don’t want the precious time you’re spending on your hobby or passion to outweigh the time you’re spending with your husband and kids. Being a mom is one of the best gifts and privileges that God has given us. But it’s not all that we are. Make your relationship with Christ your first priority, your family your second, and somewhere on your list, make some time for pursuing your passions, too. I love being a writer. I’m passionate about my stories, and I use the daily afternoon naptime/quiet time to write. I also often sacrifice sleep to write. I don’t recommend that. Sometimes I go back and read it and realize that all I typed in the dark of night was exhaustion-induced gibberish! What are your passions and how do you pursue them?